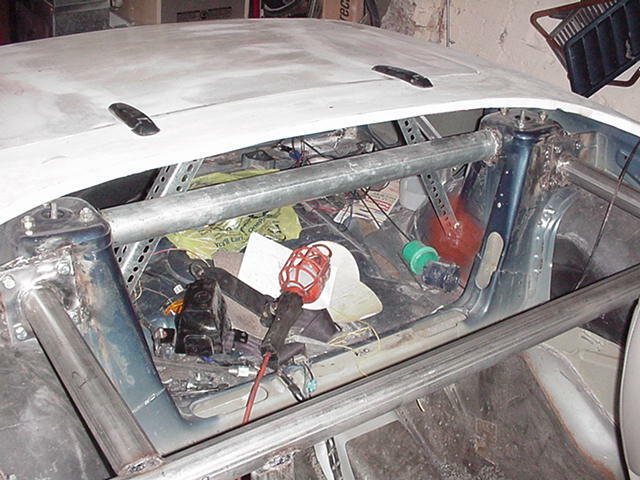 ROLLCAGE - I spent the whole winter planning/designing the cage. I put alot of thought into building the cage. I planned not to have a top on this car so I want to eliminate the main hoop above the seats. With this idea the cage was alot easier to build. I bouth 20' of stainless steel tubing from a local guy for $130 and went home start cutting it up. I decided to make a removable cage. 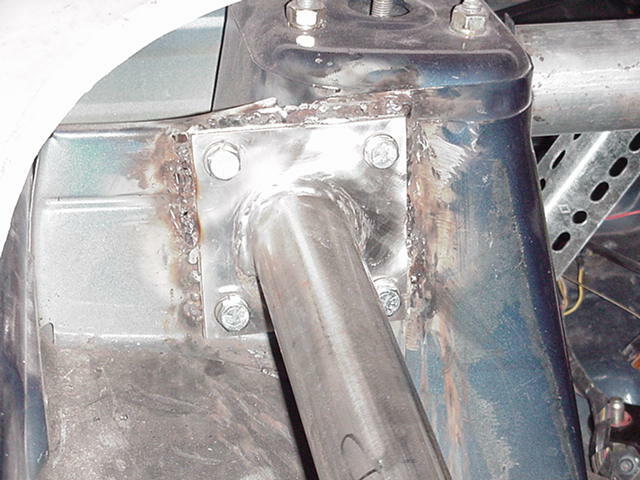 We weld stainless steel plates at the bottom of each leg and each leg has a matching plate will be welded to the car. Both plates will be match-drilled and the bottom plates will be threaded to put bolts to. 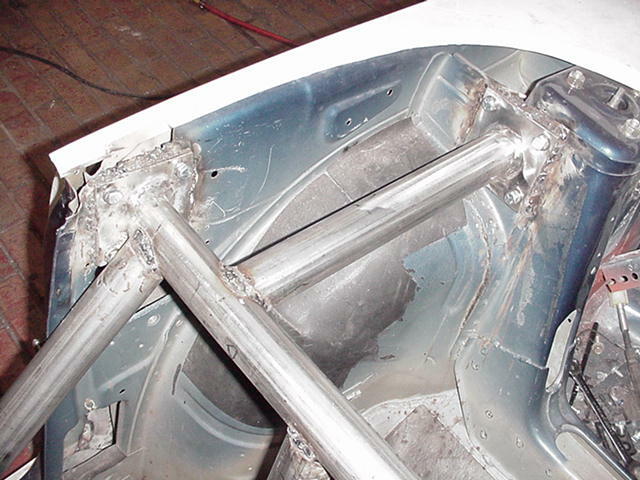 The following pictures are right after we welded the cage in. I still need to clean it up and smooth everything out and then polish the whole cage to make it complete. 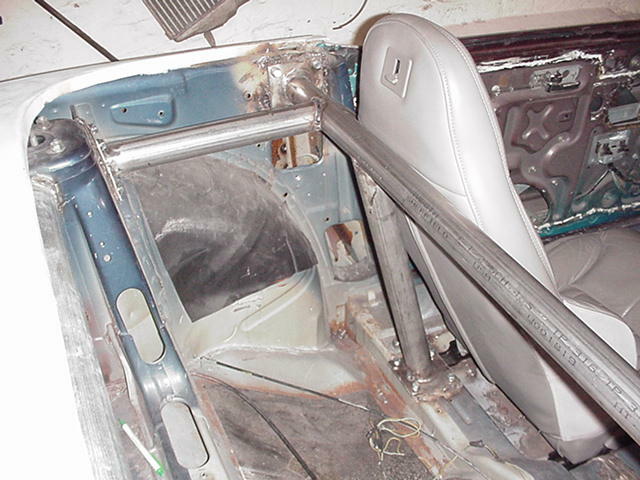 I can feel a big different with just several bolts attach the cage to the body of the car. 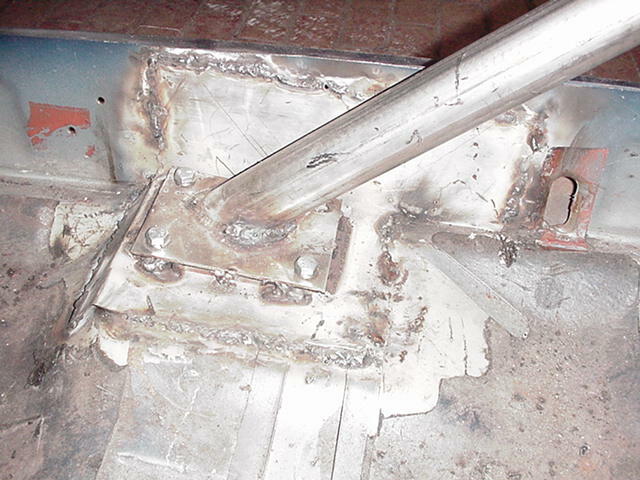 Also the sheet metal on the floor was so thin so I had to weld an angle piece of stainless steel to the floor and side wall first before welding the bottom plates. I also got the tail lights on and wired everything in. 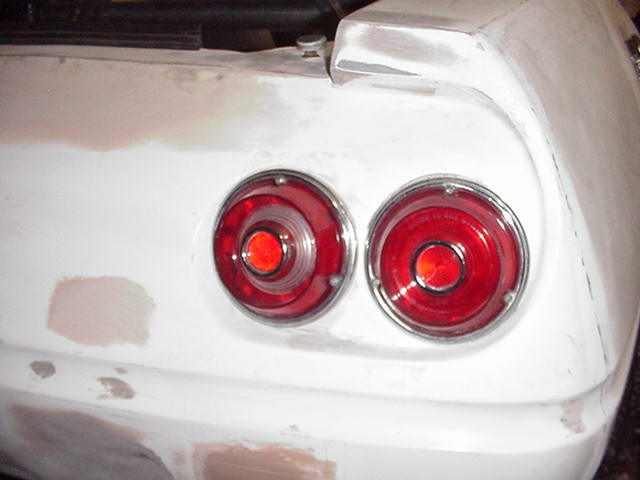 These tail lights are from a 1969 Chevy Corvair. I got them for $40 at a junkyard. The chrome trims on these light could use some reconditioning. You have to look closely to see the pitts on the chromes. Anyway I planned to get someone refinish them later. I also got this trunk support for my trunk from a junkyard. This support is from the Corvair also. Very old fashion but works very well and cheap. 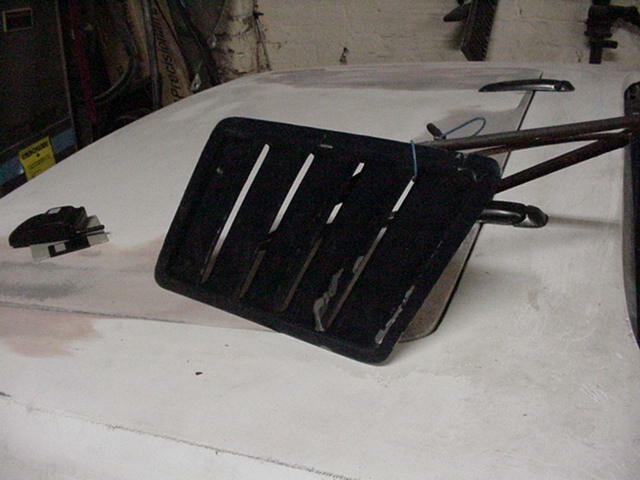 I just got a pair of trunk lid support for my 79 ZX and they cost me $60. 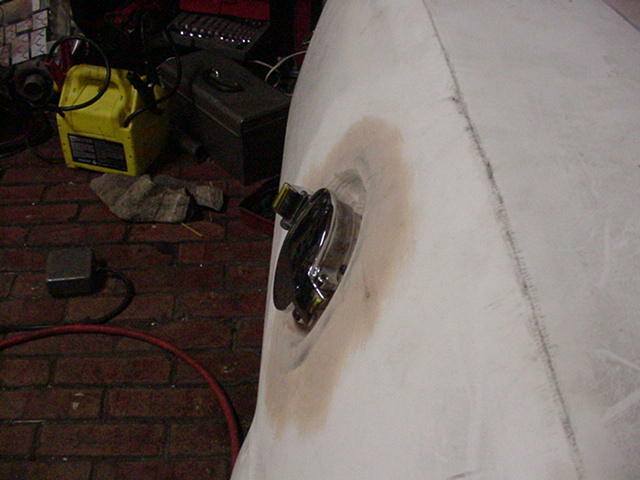 Also finished is the gas cap modification. Everything pretty much done and just need some feathering here and there. 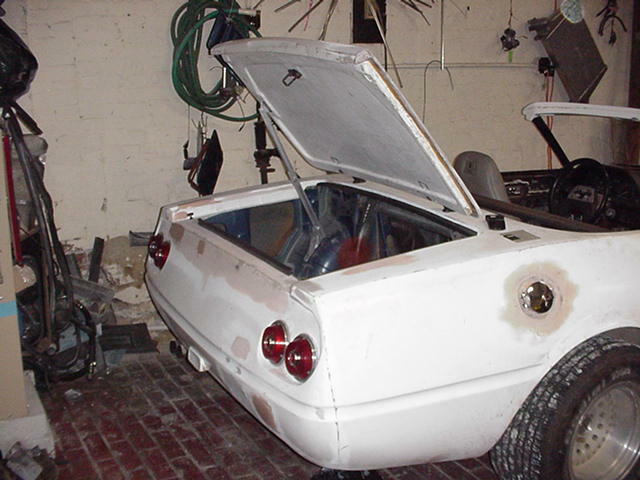 I also got a pair of Corvette leather seats and I modified the base to fit into this car. 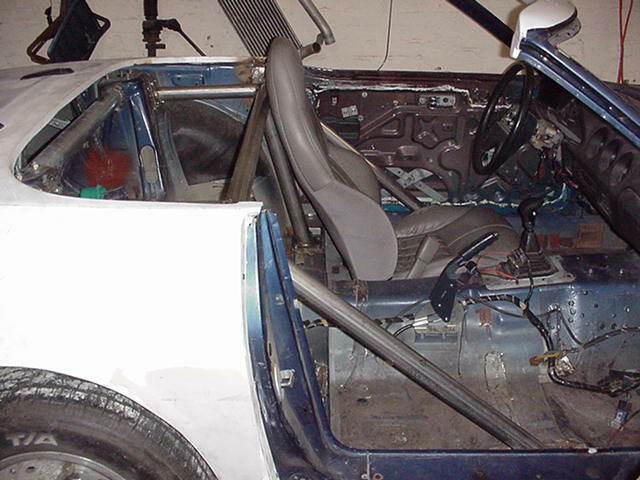 The seats fit perfectly in the car with both roll bars on both sides. I have to remove the switches on the side of the seats and move them somewhere else. Just need to run the wires to the new location. Also I have to cut the old lever used to adjust the back seat because it will hit the side roll bar. I hook up a cable to the trigger mechanism and run it to the front of the seat then put a little handle on it. Work out good. 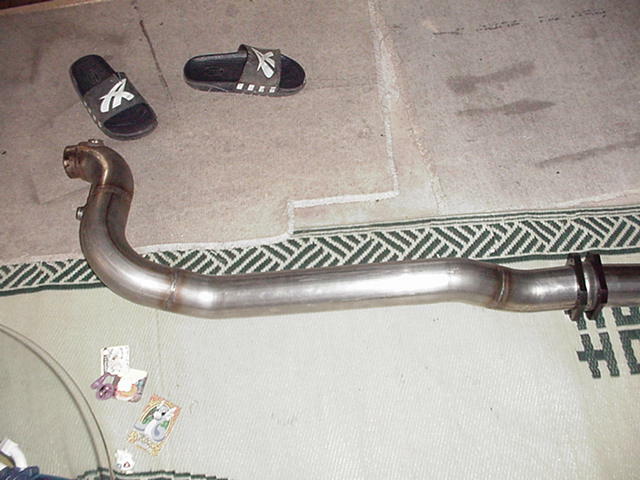 Got the stainless steel downpipe from JeffP. Waiting to get a T3/T4 then I will install this downpipe at the same time. Next up will be the header cap. Molding the head cap into the car. 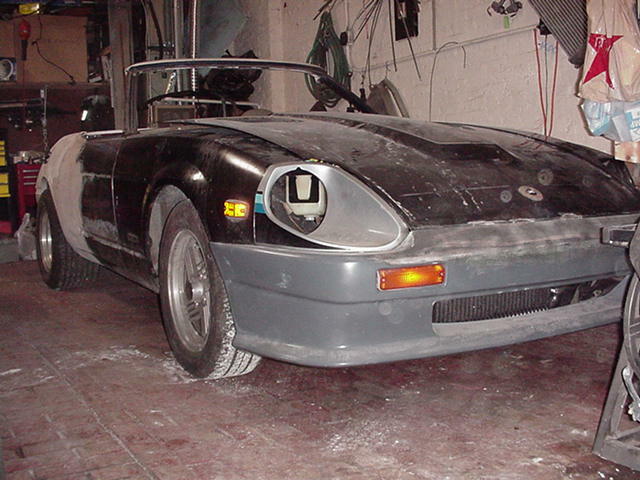 Then put in the fender vents on the side of the fenders. 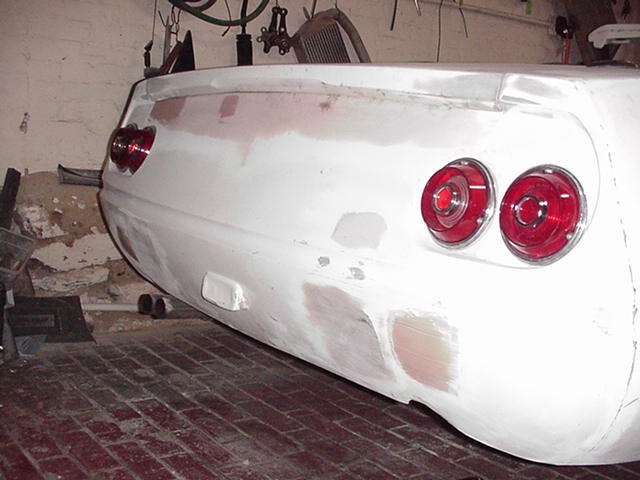 OH I forgot I found a pair of old Camaro fender vents which should go on the side of the fenders nicely. One only problem is the vents cracked and need to be repaired. My brother tried to weld it and poke a hole in one of the vent. I am thinking of using JB weld to fix it. 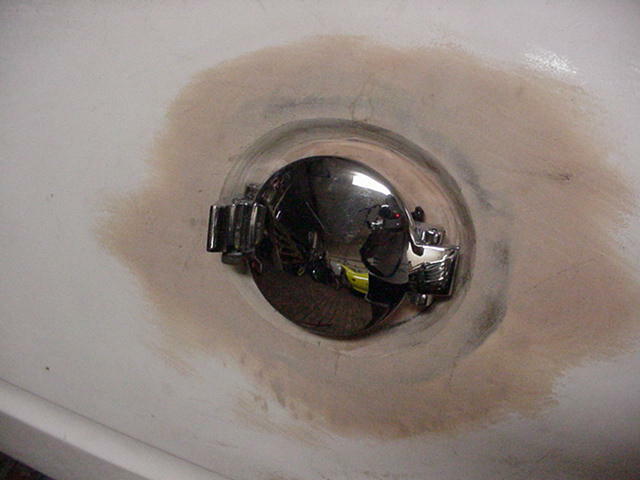 April 28, 2004 - Finished molding the header cap onto the car. 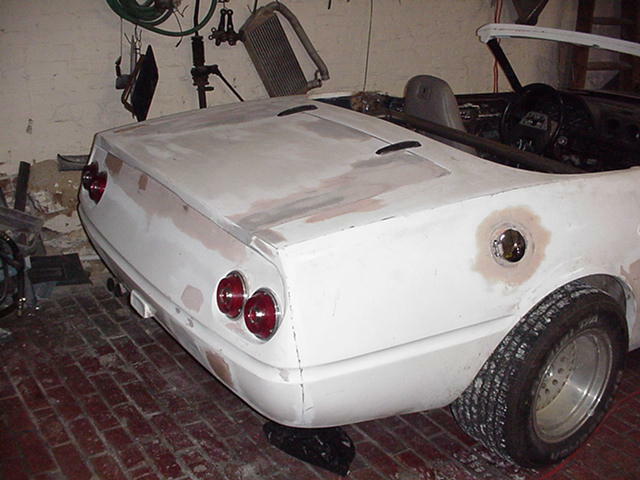 Used Aircraft remover to strip down the paint. Also found out that the car still running lean under boost. Found out that the computer plugs are not making good contact. Clean it real good and put some conductive grease to all the pins and looks like the problem is solved for a short time. 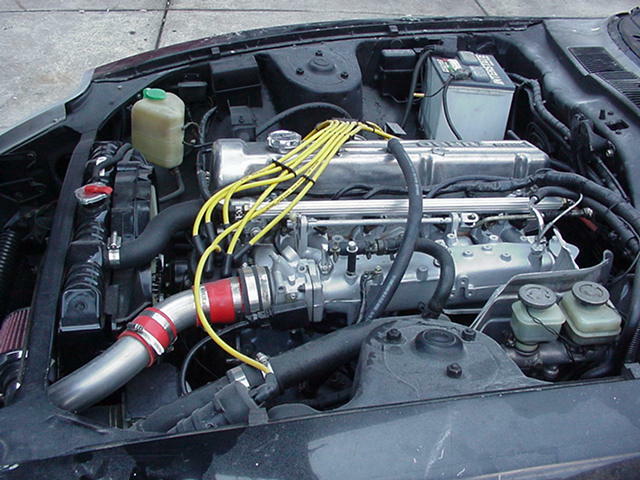 I finally went to a junkyard and cut up some computer plugs from a 300ZX and splice them into my 280ZXT and it seems no more problems now. 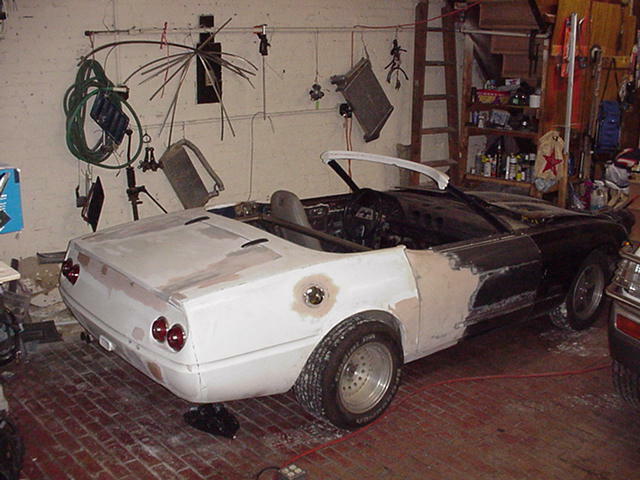 August 15, 2004 - Got a quote for $2500 to do the paint job on my car and I went ahead with it. The guy completed the body works and prepping and I double check the car and there still several spots need to be work. I fixed and wet sand the spots myself. 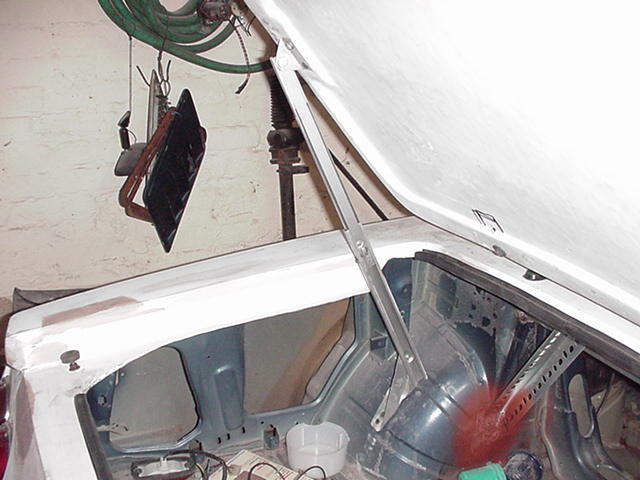 The shop had a guy does the cut-in for me that is painting under hood, door jams etc.. and looking at the work they did I told the owner I will paint the car myself and I will be using the shop's paint booth. I still have to pay the guy the full amount. This is fine with me just as long as I take my time to get my car come out good and the guy OK with it. I started by painting some small parts and then my fenders. Note: I took everything off the car and painted 1 piece at a time. Pictures will be posted on my progress soon.